Need an impressive, make-ahead dessert for your next party? 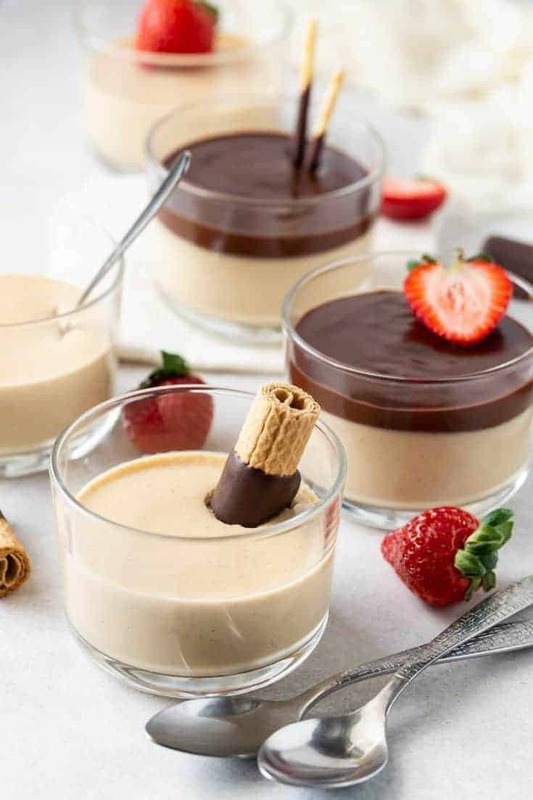 Look no further than this indulgent Irish Cream Panna Cotta recipe! No gathering is complete without something sweet to end the evening, and this gorgeous Irish Cream Panna Cotta recipe ticks all the boxes for a perfect dinner party dessert: make-ahead, easy and crazy flavorful! 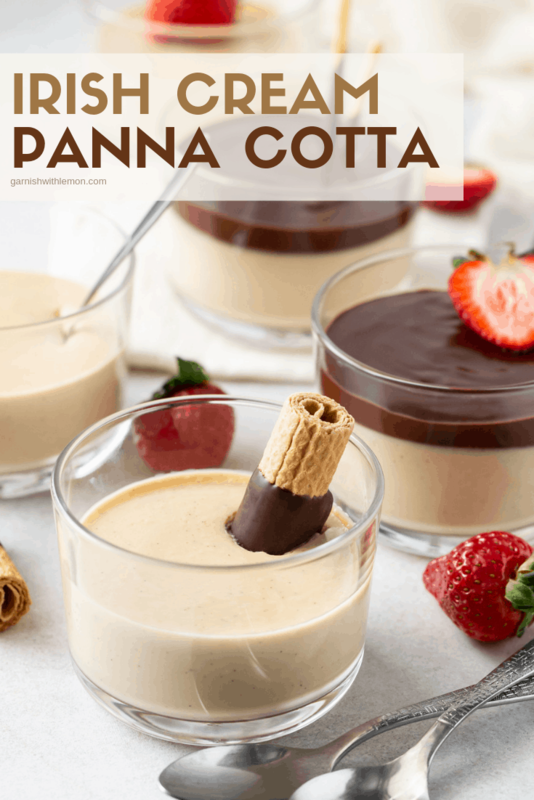 Panna cotta is a traditional Italian dessert made by warming cream, sugar and gelatin and then letting it chill until it gets a smooth, custard-like consistency. 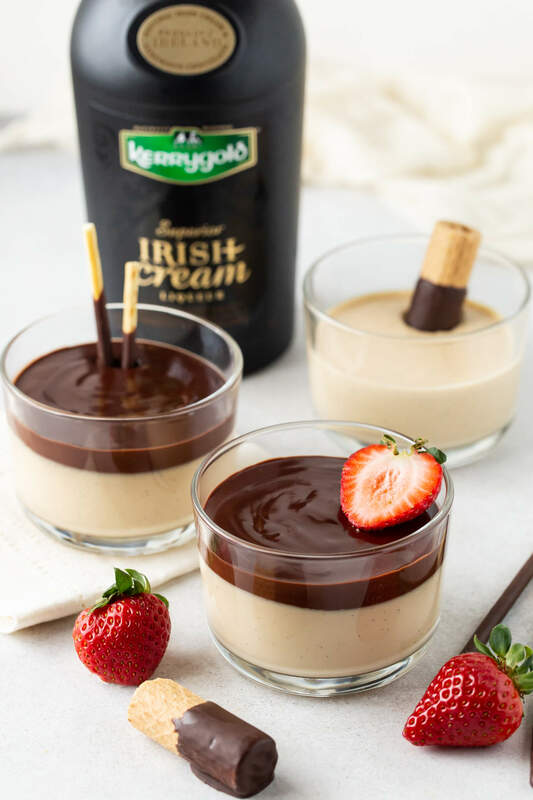 This Irish Cream Panna Cotta recipe gets a twist from the Emerald Isle with the addition of Kerrygold® Irish Cream Liqueur. Made from natural Irish cream, real chocolate and oak-aged whiskey, this premium liqueur gives this popular dessert an extra dose of decadence. How do you make Irish Cream Panna Cotta? Panna cotta might be one of the easiest “fancy-looking” desserts you can make. If you can measure, pour and whisk, you’re good to go. Start by warming cream and sugar in a saucepan. I used a whole vanilla bean to flavor the cream mixture, but if you prefer, you can just add in a tablespoon of vanilla extract after you’ve heated the cream. Then it’s simply a matter of whisking in the gelatin, sour cream and Irish Cream Liqueur. Tip: Don’t have sour cream on hand? You can always swap in plain whole milk Greek yogurt instead. I like the slight bit of tanginess that either option gives the decadent, velvety panna cotta. Do you have to refrigerate this panna cotta recipe? Yes, panna cotta contains gelatin, so it needs to hang out in the fridge in order to set up. This makes panna cotta a fantastic make-ahead dessert option for entertaining. Plan on at least 4 hours of chill time or overnight. How long will this Irish Cream Panna Cotta keep in the fridge? You can make this Irish Cream Panna Cotta recipe up to 3 days in advance. Simply keep them covered in the fridge. When you’re ready to serve them, let them sit at room temperature for about 30 minutes to take the chill off the dessert and let the flavors fully emerge. Do you have to add a topping to the panna cotta? Of course you don’t HAVE to add the chocolate ganache to the Irish Cream Panna Cotta, but no one in my house has ever turned it down! The ganache just adds to the indulgence of the Irish Cream Liqueur in the panna cotta recipe. Other garnish ideas include chocolate covered biscuit cookies or even just a dollop of whipped cream or a few fresh raspberries. 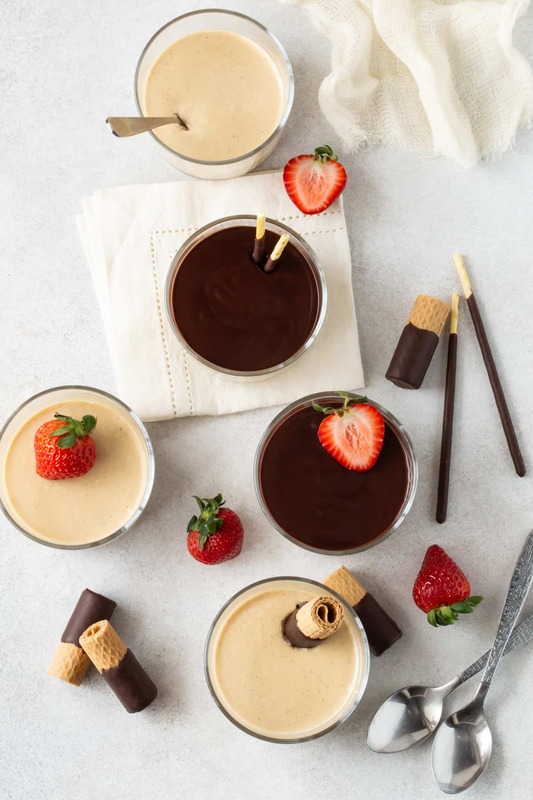 End your party on a deliciously decadent note with this easy, make-ahead Irish Cream Panna Cotta recipe! Place cream and sugar in a small sauce pan. Split vanilla bean lengthwise, scrape out seeds and place both the vanilla pod and the vanilla seeds in the pan. Bring to a simmer over medium low heat, whisking occasionally to dissolve sugar. Once hot, remove pan from heat and remove vanilla pod from pan. Sprinkle gelatin on top of the cream mixture and whisk to completely dissolve. Whisk in sour cream or yogurt and Irish Cream Liqueur. Evenly divide panna cotta among 6 ramekins. Cover and refrigerate for at least 4 hours or overnight. Place bittersweet chocolate and cream in a microwave safe bowl. Heat at 50% power for 60 seconds. Stir and repeat in 30 second intervals until completely melted. You can substitute 1 tablespoon vanilla extract for the vanilla bean in this recipe. Stir into cream and sugar mixture after it has been heated through. I live in Cape Town an unfortunately “The Kerrygold licquer) is not available here .I love my Irish cooking an I wonder if I can any of the other Irish lacquers on offer in the bottle stores here.I can buy kerrygold butter here every week. Hi Margaret, if you can’t find Kerrygold Irish Cream Liqueur, you can substitute another brand of irish cream liqueur if you can find it. Otherwise if you can’t, this recipe is just as delicious if you omit the liqueur entirely and replace it with an equal amount of heavy cream.